Holla! I'll be at Crafty Wonderland AND Handmade Bazaar next weekend- selling my goods and being surrounded by a bajillion lovely handmade things by other craft artsits! If you're in the 5-0-3, these are the places to be! 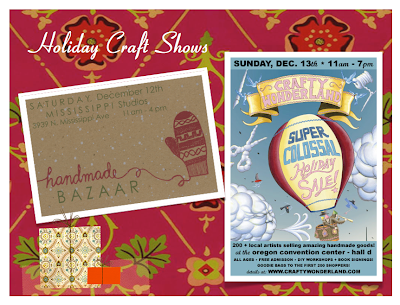 ❉200+ vendors, crafty workshops & goodie bags to the first 200 shoppers! The Unfriendly Skies of United Airlines! So, I avoided flying with them. I so regret not taking Frontier when I went to Nashville! Earlier this week, I was left, with several other passengers, stranded at O'Hare airport over night, with no assistance from customer service. In fact, we received insults and I really thought they were going to yawn while talking to us. They almost mimed boredom and apathy. some customers were offered flight vouchers, first-class upgrades and miles, others, including myself were offered nothing! I tweeted my pain, called one of my best friends in the world who happens to live in Chicago, and bid farewell for the evening to my fellow strandees that would be sleeping in the airport, or maybe staring angrily at United employees! I have lost a full day's wages due to this, missed meetings and scheduled time prepping for my craft sales, and had to pay ground travel, lodging, and meals for that night in Chicago. It was only made worse by the poor customer care I received. I wasn't even treated well on the flight that I finally made home! I feel overwhelmingly wronged, and I feel very strongly that United Airlines needs to extend an apology to me and my fellow strandees as well as some sort of compensation. I am not naive enough to ask for cash- I know full well that many of these policies and poor customer service experiences are related to the poor economic state of the airlines. I never even received any form of apology- not even a fake one from the horribly rude employees! So, I wrote them an email (they have no option to speak to people in person anymore) and hope to hear back from them. I'm not holding my breath after looking around the internet at other people's grief! And, is it just because I re-read Asimov's Foundation, or is it true that the airlines are backsliding into barbarism? United- you are the harbinger of the decline of society!!! if you tweet, please send @untiedairlines a message like : hey @unitedairlines, please apologize to my friend @superphoebe for bad service when you stranded her at O'Hare! Update- thanks for this Lauree- LOLz!